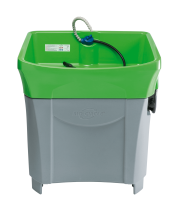 BIO-CIRCLE L is an innovative, efficient surfactant cleaner for use in the BIO-CIRCLE parts washer. It is used for cleaning and degreasing small parts in workshops, industry, and service. The Liquid contains natural microorganisms that degrade the ingressed oil, thus guaranteeing long cleaner service lives. BIO-CIRCLE L does its cleaning based on water and removes everyday contaminations, in particular oils, greases and particle impurities, from work pieces such as moulds. 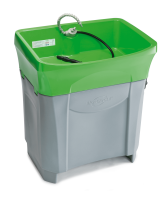 Its employment in the BIO-CIRCLE parts washer and the microorganisms contained therein guarantee a long service life for the cleaning fluid. The parts washer filters major particles from the fluid, and the microorganisms degrade the ingressed oils and greases. The fluid will not pit the surface of the parts to be cleaned, and special corrosion inhibitors provide temporary protection after cleaning. The Liquid does not require labelling under the CLP Regulation. In addition, it is free from solvents and volatile organic compounds (VOC). The surfactants therein have been selected on the basis of renewable resources. Skin friendliness has also been dermatologically tested, which guarantees improved skin protection. A fresh apple scent makes cleaning on the parts washer a pleasant job. By using BIO-CIRCLE L, the use of solvents can be avoided altogether. This makes the cleaning agent easy and safe to use, store and transport. The environment is protected, and occupational safety is increased. The cleaned surfaces can be rinsed with water without leaving any residue, which makes the cleaning agent also suitable for use in the food industry. Related links to "BIO-CIRCLE L"
BIO-CIRCLE L has been specifically developed for use in the BIO-CIRCLE parts washer. The ready-to-use Liquid is poured into the reservoir of the parts washer, without adding water. As there are microorganisms in the cleaning fluid, no strong acids, alkalis, disinfectants or solvents should be added so as not to endanger them. Accordingly, only original BIO-CIRLCE L should be added to the fluid so as not to affect the lifespan of the microorganisms. In case of applications in the food industry, the cleaned surface should be rinsed with water after cleaning.